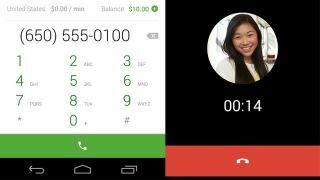 Google announced the availability of free voice calls from the Hangouts app for Android, iOS and web, which includes the ability to dial up regular phone numbers and other Hangouts users alike. Although Hangouts has always offered unique methods for sending messages or setting up group chats , outgoing voice calls have remained elusive, primarily the jurisdiction of the Google Voice service. That all changes with the updates, which also includes competitive rates for outgoing international voice calls as well. Service to mobile phones in France are priced at $0.03 per minute, Mexico $0.05 per minute and India a mere one cent per minute. Back in May, Google engineer Nikhyl Singhal confirmed plans to migrate the largely stagnant Google Voice service into Hangouts with outbound calls; incoming voice calls have already been supported from both Hangouts as well as Google Voice. Today's change finally delivers on that promise, making Hangouts more of a direct threat to competitors such as Microsoft-owned Skype, although Hangouts has yet to completely absorb Google Voice. Google also updated the existing Google Voice for iPhone app, finally delivering an iOS 7-style user interface, as well as enabling support for Google Voice integration in the Hangouts app. Google says outgoing voice calls from Hangouts will be available to iOS and web users the next time they open the app, and the feature is rolling out over the next few days to Android users with the latest version 2.3 update. Super-size your reading with our hands-on review of the iPhone 6 Plus!